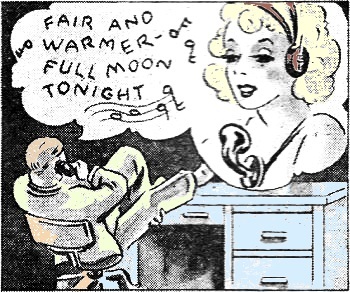 My father used to refer to the "sweet-voiced lady predicting the weather over and over again" as my girlfriend because I would call the 'WEather-1212' phone number (936-1212) so often. It really wasn't because I was infatuated with her voice, it's that I was obsessed with weather forecasting. Most of my free time as a kid and teenager was spent building and flying model airplanes and rockets, and at eighteen years of age I began taking full-size aeroplane flying lessons, so my world revolved around a zone extending from terra firma up to about 5,000 feet AGL. This collection of communications news items in a 1940 edition of National Radio News includes the creation of that very recorded weather forecasting service (we lived about 30 miles east of Washington, D.C.). Now, I admit to having a bit more of a problem explaining my frequent calling of the local time annunciator lady at 'TIme-1212' (844-1212). When Washington residents dial WEather 1212, they hear a sweet-voiced lady predicting the weather over and over again. Those who would like to enjoy the voice indefinitely are cut off automatically after about nine reports. A $20,000 telephone company gadget provides this unique service. The report, as read by a young lady selected for clearness of speech, is recorded on an endless wire tape by magnetizing the molecules in the tape in proportion to the variations in the audio signals. The message can be erased by a second magnet in preparation for re-recording whenever the U. S. Weather Bureau decides to change its prediction. A St. Louis resident complained to the sheriff's office that his chickens were being shocked by an electric fence put up by a neighbor. 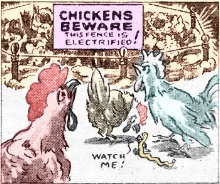 The deputy who investigated found that a bare wire, supported on insulators at the level of a chicken's head, had been erected around a flower bed to discourage destruction of young plants by the chickens. Since this fence was on private property, the law decided the neighbor was entirely within his rights in maintaining the fence. The officer gave orders, however, that a sign be erected warning that the fence was charged. 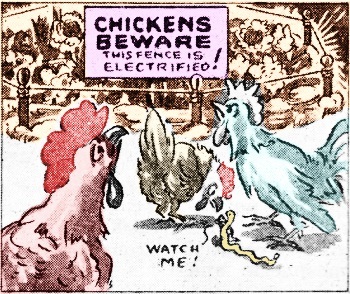 It is now up to the complainant's chickens to learn how to read. Experiments in the transmission of orders by radio from the central control tower of a railroad freight yard to switching locomotives are being conducted by the Central Railway Signal Company of Proviso, Illinois, after receiving authorization for this purpose from the Federal Communications Commission. Construction permits were issued for two 15-watt stations, one operating somewhere between 300,000 and 400,000 kc., and the other being assigned to four different frequencies in the range from 35,000 to 40,000 kc. This newest application of radio may mean hundreds of additional jobs for men with radio training. Portable radio receiver are the newest menace facing radio engineer during broadcast pick-ups from remote points, according to a report from station KDYL of Salt Lake City. Members of the audience at the scene of a remote broadcast tune their portables in on KDYL, thereby creating feed-back. 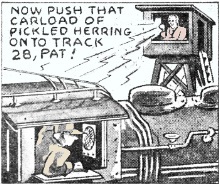 Before future broadcasts, engineers plan to seek out the portable radios and issue appropriate instructions or warnings. An automatic phonograph which will play any one of ten different songs when a penny is inserted, has been developed recently by Dr. Gordon K. Woodward, a Los Angeles physician. The special record used with this phonograph is sixteen inches in diameter, and contains ten separate songs on each side. 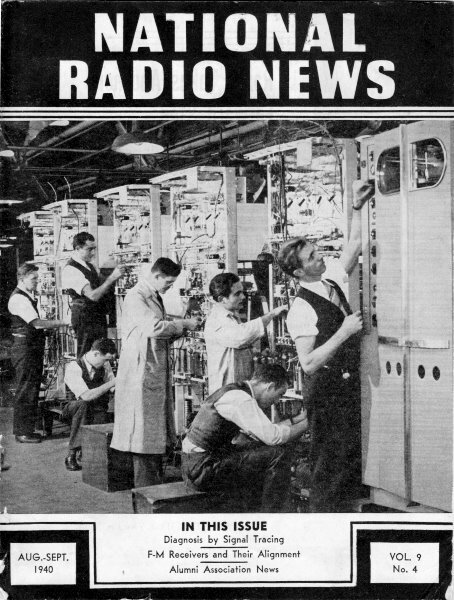 Broadcast interruptions due to rectifier tube failures are eliminated in the new 50-kilowatt transmitter of KDKA at Allison Park, Pennsylvania, by tube-changing relays. These automatically disconnect a burned-out tube from the circuit and connect a new tube into the circuit. Not a single mercury vapor rectifier tube is used in the dozen of transmitters and receivers for the Byrd Antarctic Expedition. All rectifiers are of the high-vacuum type, for mercury is slow to vaporize at the low temperatures encountered. Likewise, there are no electrolytic condensers in any part of equipment. Apparently the electrolyte freezes at temperatures below zero, for chief radioman Bailey says you might just as well use block of wood. 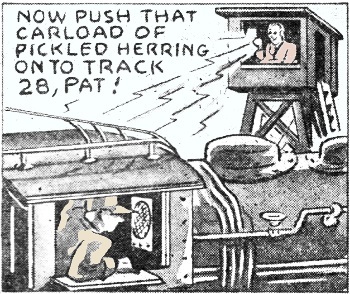 Typing speed is indicated directly in words per minute by a unique new electronic gadget employing two radio tubes and a vacuum tube voltmeter. Hitting a typewriter key closes a relay circuit, thus applying a charging impulse to a condenser. Between strokes, a motor-driven cam switch discharges the condenser a certain amount through a resistor. A vacuum tube voltmeter connected across the condenser is calibrated to read words per minute instead of volts.